Quickly and easily select or enter work, contact, and financial details to create any new transaction seamlessly, via simple walk-thru prompts that automate the process of creating Offers, Invoices, Consignments, and eight other transaction types. At left, Contacts and Works are found and selected for a new Invoice transaction. Additional information, including financial details, is entered directly on the Invoice form.When creating a transaction, Pro makes instant updates to all related records, so double entry is never necessary. For example, when an Invoice record is saved, the sales status and Financials for the work(s) are automatically updated, as is the Accounting and Collection section of the Contacts record. And when any work is shipped, its location is also automatically updated. 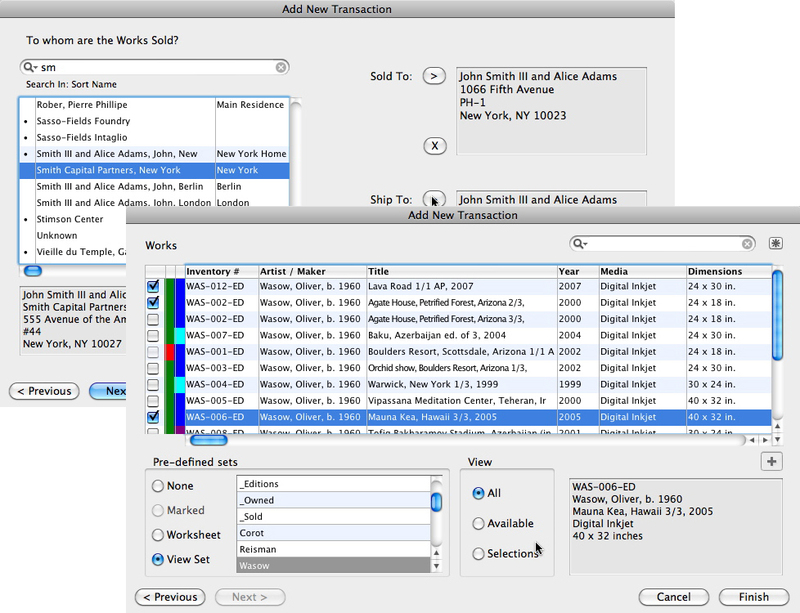 Using the transaction walk-thru prompts, Pro can make a formal Offer of selected works, which is saved to a contact's history. As with any transactions, a formal document can be generated in Microsoft Word with a single click. An Offer can be converted to an Invoice automatically, adding the accepted works with and previously entered accounting details. As always, all related records are updated automatically. Additionally, one can generate an offer of works via an email that saves to a contact's record. 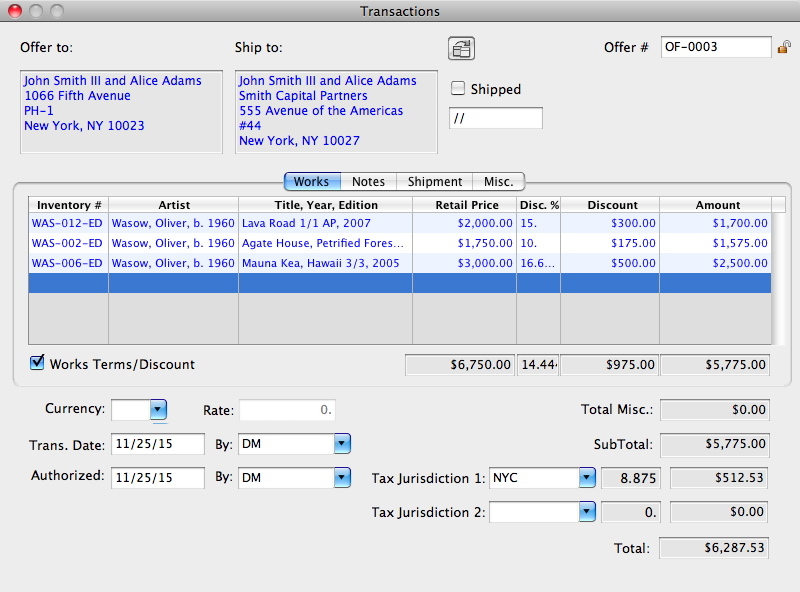 Sales information, including contact details, is drawn from Works and Contacts, and can be exported directly into the appropriate accounts in QuickBooks Pro for a complete general ledger accounting solution.One may record shipment details in the Shipment tab (and/or a separate Shipment transaction), transaction notes in the Notes tab, and miscellaneous additions to an invoice such as framing or shipping charges in the Miscellaneous section. Consign works to a contact with a generated document and automatically record the Consignment in the contact's record, with dates and other terms. 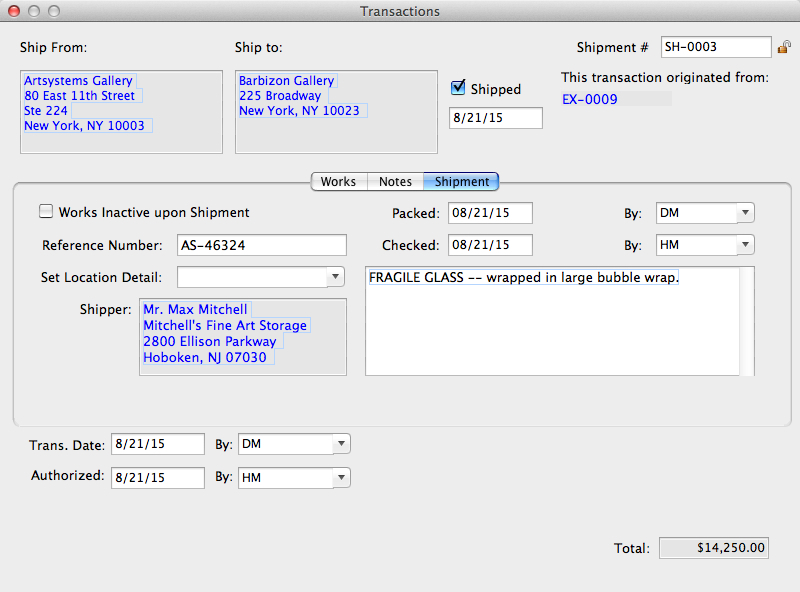 One can then automatically select and convert any sold works from a Consignment to an Invoice transaction. 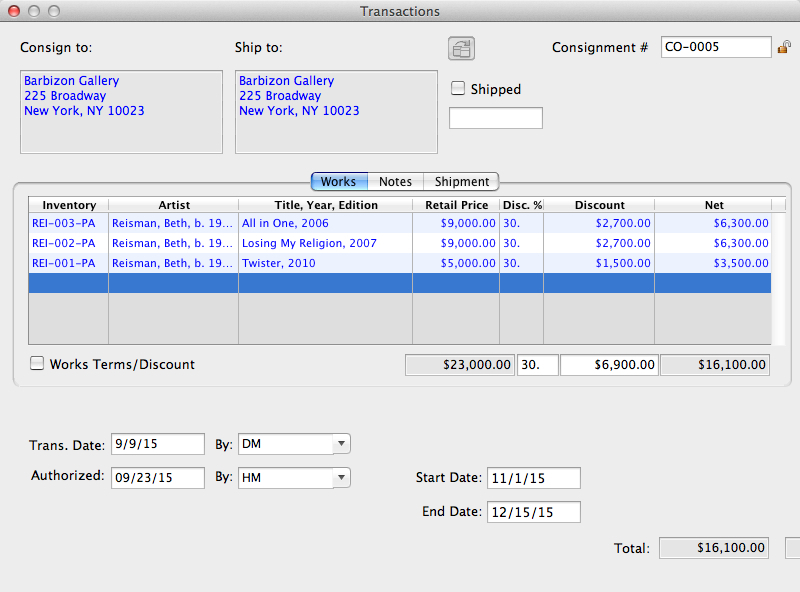 Then, tag the remaining works for a Return transaction.All works on consignment will either be invoiced or returned. As always, related records are updated automatically. Besides Offers, Invoices, and Consignments, additional Transactions that can be generated, recorded, converted, and linked automatically to related records in the same manner include Cash Sales, Credit Memos, Loans, Exhibitions, Shipments, Returns, Work Receipts, Payments, and Payment Receipts. 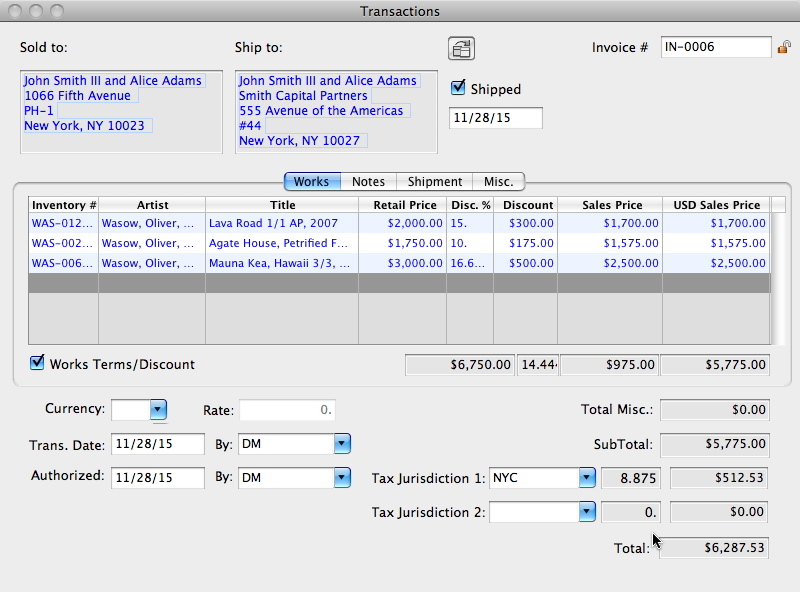 Of course, a formal document for each of these transactions can also be generated in Microsoft Word in a single click.